Habit: Annual, erect, 5--25 cm, glabrous, occasionally glaucous. Leaf: basal; 3 × ternate-divided; segments short-linear, acute, condensed at end of long petiole. Inflorescence: flower 1. Flower: bud generally nodding, acute, glabrous, occasionally glaucous; receptacle obconic; petals (10)12--25 mm, yellow. Fruit: 4--7 cm. Seed: 1.2--1.8 mm wide, round, minutely pitted, tan to ashy-gray. Chromosomes: 2n=14. 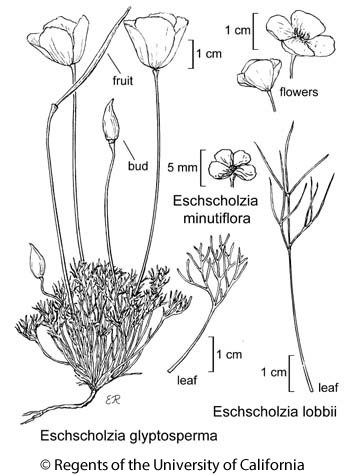 Citation for this treatment: Gary L. Hannan & Curtis Clark 2012, Eschscholzia glyptosperma, in Jepson Flora Project (eds.) Jepson eFlora, http://ucjeps.berkeley.edu/eflora/eflora_display.php?tid=25208, accessed on April 19, 2019.